The VA’s problems began in Phoenix, where it was discovered that employees had doctored patient wait lists to make their own performance look better. Audits subsequently found problems nationwide. 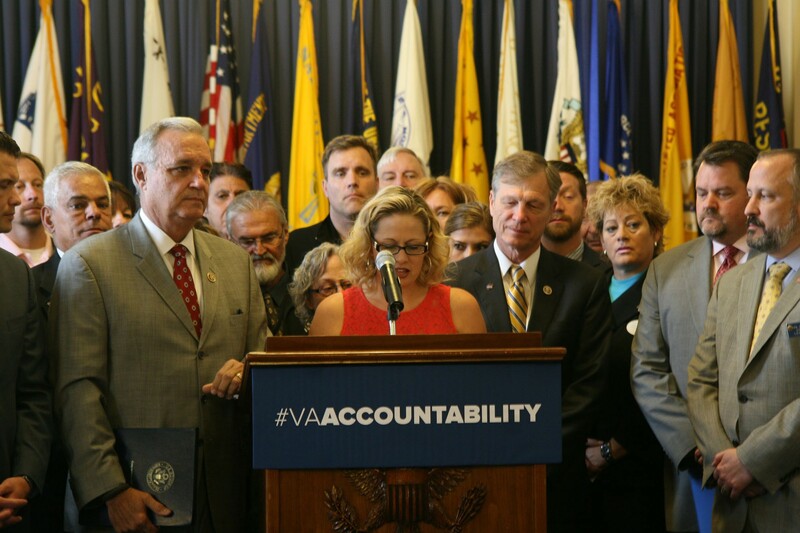 “A year ago this month we learned that veterans in the Phoenix VA were kept on secret waiting lists, waiting months before seeing a doctor and not getting the care they needed,” Sinema said Thursday. But Sinema and Rep. Jeff Miller, R-Fla., the chairman of the Veterans Affairs Committee, said that since that time, no employees have been fired for waitlist manipulation, and some have continued to be paid while under investigation. “Three executives responsible for the tragedies at the Phoenix VA were placed on administrative leave. Two of those employees are still on paid leave and tomorrow will be one year,” Sinema said. They said changing that system starts with House and Senate bills that would give the secretary of Veterans Affairs the authority to remove or demote any employee based on performance or misconduct. A similar version of the bill was introduced last year but never passed. Senate sponsors of the Increasing the Department of Veterans Affairs Accountability to Veterans Act of 2015 are Republicans Jerry Moran of Kansas, Marco Rubio of Florida, Kelly Ayotte of New Hampshire, Joni Ernst of Iowa and John McCain of Arizona. Miller is the lead sponsor of the House version of the bill, which Sinema has co-sponsored. 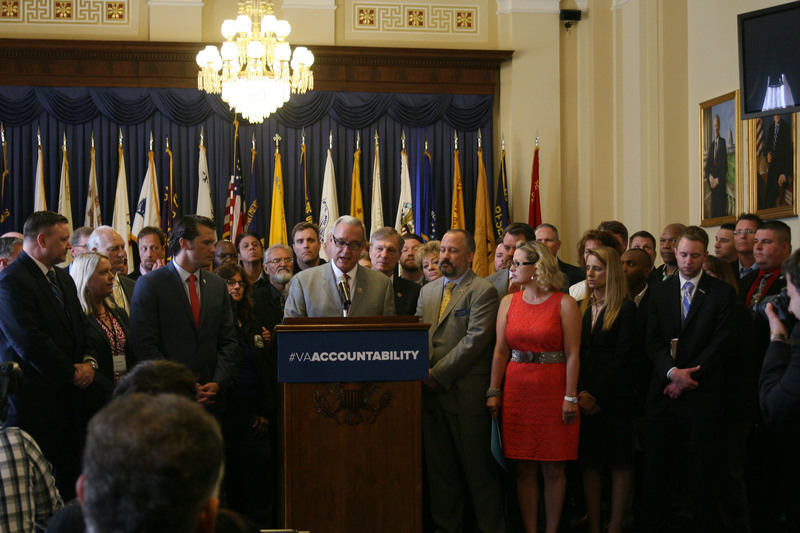 “The VA’s accountability record in one word would be ‘non-existent,’” Miller said Thursday. The bill also includes provisions to ensure whistleblowers are protected against retaliation. Veterans’ advocacy group leaders at Thursday’s event said the bill was overdue. “This is kind of a familiar crew,” said Concerned Veterans for America CEO Pete Hegseth. “These same four groups, along with Chairman Miller and Sen. Rubio, stood here in the House about a year ago trying to enact the VA Accountability Act,” he said, but that bill died. 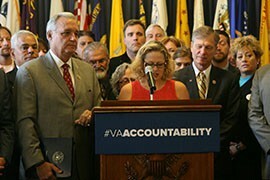 Rep. Kyrsten Sinema, D-Phoenix, said revelations of doctored wait times and delays of months for veterans seeking care at the Phoenix VA were both "shocking and sickening." 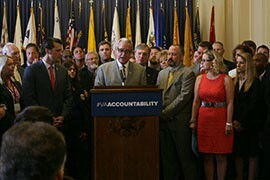 Rep. Jeff Miller, R-Fla, and Rep. Kyrsten Sinema, D-Phoenix are flanked by dozens of advocates as they call for new accountability at the Department of Veterans Affairs.